I get there late, 10:30 at night, and they’re slow about opening the door. They’re not expecting me, and I’m guessing Jack’s wife – a bland woman, formerly a friend of mine – `is already in bed. The dog barks as soon as I pull in the driveway. I hear the baby cry. The porch light flicks on as I pull my luggage from the trunk. I’ll tell you this: I take my time. Jack’s at the screen door and his wife is next to him in her bathrobe, holding the baby. The porch light shines in their eyes, making it impossible for them to see me; I’m a shadow. “Who’s there?” they say, as though I’m a burglar creeping around their house. They shield their eyes, searching the distance, a big dark void, to find me. This is how I do it: I march up the sidewalk lugging my suitcase next to me and I say, “Surprise” without enthusiasm, as if they should’ve known I’d show up, after all these years. There’s a hint of challenge in my voice. “Jesus,” my former friend says. She tries to sound excited, but her voice is like mine and betrays her. She’s rattled and cautious, like she’s just spotted a spider inching toward her bare feet. She can’t hide her apprehension, her reluctance to invite me in. We stand for a few minutes, exchanging pleasantries, me with my suitcase tugging on my arm and my friend closing her robe tighter at her neck and scooching the baby farther up her hip. “Oh, you wouldn’t believe it! Sooo much has happened!” I exaggerate. “For starters, I quit my job today.” They try not to blink or seem like they’re judging me. “Then I just started driving. I’m on my way to Florida for vacation,” I lie. I tell them I thought of them at the last minute. We talk politely, but they still don’t invite me inside. I tell them half-truths, and they nod. We act like we’re not uncomfortable with each other. The wife, she jogs the baby to her other hip. She listens to me as if I were a traveling salesman or a Jehovah’s Witness trying to sell her something she doesn’t quite want. She would just as soon close the door without remorse. “Listen,” I finally say, “I want to apologize for everything back then. I’ve really changed a lot in the last few years.” I don’t mean it, but I say it because I want them to let me in. I have nowhere else to go. The dog is looking at me through the screen door. He wags his tail. “Oh,” Jack says. “Don’t worry about it.” I have no idea how much he remembers, but he pretends he knows what I’m talking about. He pretends it’s water under the bridge. The wife, she half smiles, though she’s suspicious. She’s still not a believer, no matter what good news I or the Jehovah’s Witnesses have to share. “How about a drink?” Jack says. “You thirsty?” He opens the screen door. I don’t say yes or no, but I pick up my suitcase and step inside. I find a chair in the living room and sink into it, then park my purse and suitcase on the floor next to me and look around. This is not how I pictured it. Not them, not their house. Their furniture is so heavy and immovable you could sink a ship with it. There are toys and shoes and clothes strewn about; a tent set up in the living room, filled with stuffed animals for the baby; a chalkboard in front of the fireplace blocking the hearth; newspapers scattered across the floor in a lazy attempt to housetrain the dog. There are pee stains. An antique coffee table is stacked with dirty dishes. I can barely take it all in. I had not expected to dislike their lifestyle. From the outside of this house, I had expected to be envious. I’d planned on hating these people and disrupting their life. They have two boats in the driveway. “God, I feel terrible – I got here so late and woke the baby,” I say. “I should’ve called first. Maybe I shouldn’t have come.” I prop my feet up on the ottoman and relax. “Forget it!” Jack says, fixing drinks in the kitchen. I’m guessing he’s had a few already, based on his levity, his willingness to forget. “What’s your poison?” he calls to me. “Nothing,” I say, and this is true. I don’t drink anymore, but they don’t know that. “What?” he yells from the kitchen, meaning he’s heard something unbelievable. “Tell that to Jack,” she mutters. She’s sick of it, I can tell – plus she was always a lightweight, unable to keep up – and for a split second I almost feel sympathy for her. We’re silent for a moment, even the baby and the dog and the television. Then I pat her hand and smile as though I want things to work well for her. She doesn’t move. We both know I’m not here as a long-lost friend, a miracle of compassion showing up on her porch just in time to throw their marriage a buoy. I’m here to get away from my own mess, not straighten out theirs. You’d think with two boats and a BMW they could hire a maid. It’s lakefront property, for God’s sake. Meanwhile, I’m broke and middle-aged, an underemployed secretary who was recently fired. Hey, but who cares? It’s not like they’ve been wondering about me these last few years. Not since Jack’s wife got pregnant, ensuring their marriage. It was a hysterical pregnancy, not even the real thing, so I can’t say I’m indulgent of their giant mess or the fact that Jack’s wife wants him to stop drinking. Let’s just say, if I were bent on revenge – and I’m not – there’d be very little left to destroy. Jen Grow is the fiction editor of Little Patuxent Review. Her writings have appeared in The Writer’s Chronicle, Other Voices, The Sun Magazine, Indiana Review and many others including the anthology City Sages: Baltimore. 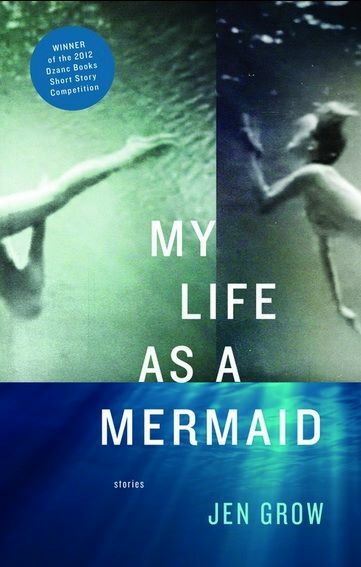 She’s received two Individual Artist Award from Maryland State Arts, and her story collection, My Life as a Mermaid, won the 2012 Dzanc Books Short Story Competition. She lives in Baltimore, MD. Contact the author.